Villa Mercury is located in Firostefani village, the most beautiful secret of Santorini’s Caldera, right across the island’s volcano. An emblematic cave-style architecture, typical of Santorini, minimally decorated, with natural materials and handcrafted furniture. The Villa’s terrace is ideal for resting, with a scenic infinity-edge pool featuring hydro-massage, a beautiful dining area and comfortable daybeds. Villa Mercury is part of a 2-villa complex and it can be rented separately or as an entire unit. A connecting door can be kept open to link the two villas or locked to separate them and allow full privacy. The two villas share the infinity-edge pool overlooking the captivating, unsurpassed panorama of Santorini’s Caldera. -	Living and dining area. -	Checkout time: 12 noon. Late checkout upon availability with extra charge. -	Published rates are subject to revision without prior notice. -	Extra bed must be requested prior to arrival at a charge (up to 1 extra bed max). -	Down payment 40% of the total amount upon reservation. -	Balance 60% of the amount 60 days prior to arrival. -	Security deposit 25% of the total amount required 2 weeks prior to check-in with a wire transfer or with credit card pre-authorization upon arrival. -	Down payment 100% of the total amount upon reservation. -	Bottle of local wine and welcome fresh fruits basket upon arrival along with mineral water. Villa Mercury is a one-floor property, featuring a beautifully decorated and cozy living and dining area, and a fully equipped kitchenette. 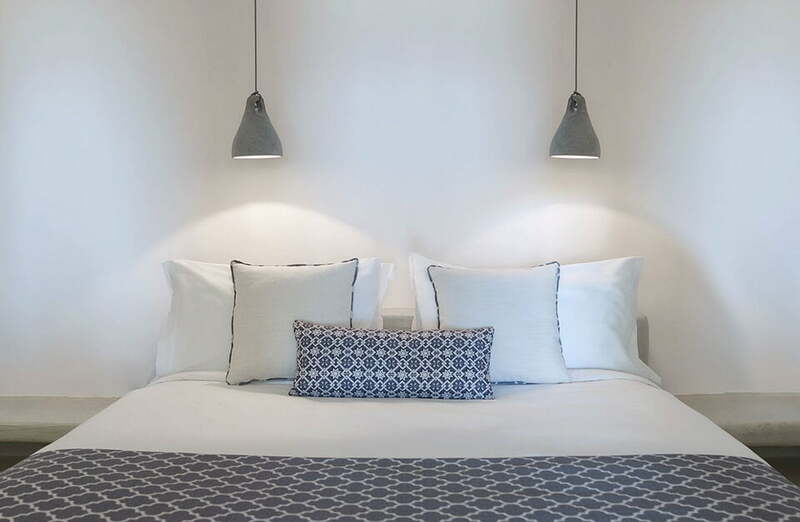 Villa Mercury’s bedroom has a king-size bed and is separated by an arch, a typical architectural element of Santorini while the bathroom includes a large bathtub and a shower.